Spending time back home in Michigan the past few summers, my husband and I connected with family and pals from childhood, high school, first jobs and those who were there when we met and married! Lots of retelling……and rehearing…..the same old stories, but the laughter was always fresh! We needed to rehash, recall and relive some of those important moments in time that tend to stick. And as always these days, the conversation eventually turns to our children...yikes, how can they be pushing 50 while we’re still so young?…and our grandchildren! From a brand new great-grandchild to a granddaughter off to college, we nodded and clapped and shared in each others’ pride and joy in these precious rewards we receive for raising our own kids! but usually a two-day road trip each way! Oh what fun we'd have! Blue highways where you can take your time and see small town America; try Mom and Pop diners and pizza joints, see farm after farm with dairy cows, corn fields, bales of hay and handsome horses grazing around every curve in the road! It’s always a favorite to see the Amish folks in Northern Indiana out and about in their horse pulled carts. One time we were passing through local town Festivals…..so the carriages were filled with families and they were everywhere. I have so much respect for these people and was especially pleased to see some had embraced safety over modernization and installed stop lights and blinkers on their carts! We listened to Kid Rock and Seger CD’s in Michigan of course, sang along (over and over again) to “Ain’t that America, you and me; ain’t that America, home of the free” all through Mellencamp’s Indiana. By Tennessee we’d moved onto Travis Tritt’s “Here’s a quarter, call someone who cares”……..and then a little Huey Lewis and Adele thrown in as we made our way home via more back roads! Great fun…….singing along as the miles go by always seems shorter! Reluctantly, we'd have to tune it down, hook up with I75 and join the highway-free-for-all the last couple hours. No photos to post……..but oh, so many pictures captured in our hearts. The spilled wine, the scenery, the shouts of “I love your hair/love your shoes,” and that side-hug-and-a-handshake guys do. Our old campus has grown and changed so much it’s hardly recognizable; and the welcoming smile of the pizza lady who’s still there……where my kids stood on those same little steps to watch the pizza dough twirl......she's still there! As time flows on, our friends mean more and more because we've all made the same journey together. Maybe not side by side in the same town, but certainly soul to soul and heart to heart over the years in phone calls, Holiday cards, visits home or shared vacation spots. Thanks to each of you who always found time to be with us for a few hours! Now it's Michigan time again; only I'll be going back alone this summer. I'm flying, the vibe will be different...but home is home. During the years we lived there, Winter Wonderland was fun as we skied and skated and sloshed through snow as if there was no other way of life. But after moving south and making regular visits home to see my folks,the highlight for me was driving under the Say Yes to Michigan sign after hours of driving! 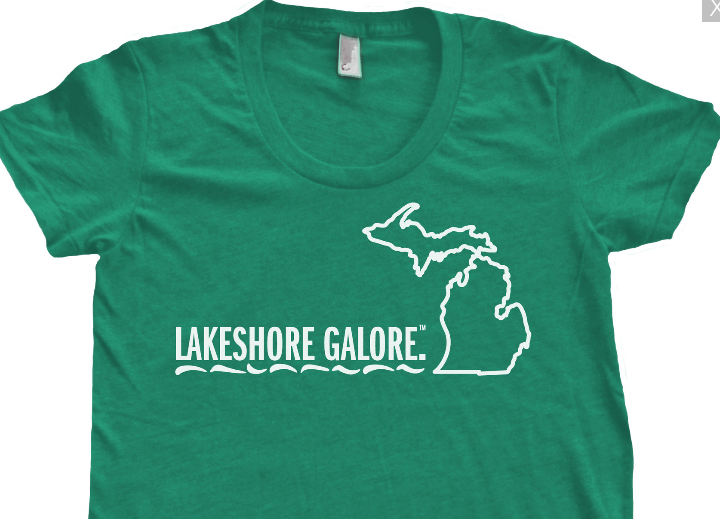 And although Pure Michigan addresses all that this great state has to offer, including the cities that cater to agriculture, hunting, industry and shopping; my favorite is the new Lakeshore Galore slogan! The Great Lakes state has over 11,000 inland lakes, one on which we owned a house for many years. Friends and relatives have lake homes 'up north' and 'down west' as the smaller lakes that lie along....and are fed by...Lake Michigan are referred to. This year I can't wait to visit a few more, have new adventures and make new memories! I went to college at Michigan State. My parents met at the University of Michigan, so I have fond memories of Michigan, where I roomed with my best friend. Loved this post. 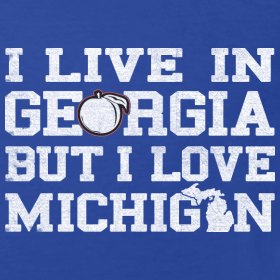 You KNOW this was the first link I went to today -- Michigan! Had to read this one first and I can so relate. Going home last fall for the first time in 10 years was just the best experience. It isn't really Michigan that I miss but the people there. Hope your next trip is just as wonderful. I love that you both have connections with the Mitten State! Well, I'm still here. In GR. A mere 50 miles from where all your happy memories still lay. The winters could be better, but I still love it. Friends who visit from other states often say, "I can't believe how GREEN everything is here!" And they envy how a beautiful beach awaits most of us within an hour's drive. We've traveled to Indiana too, taking the same small-town route that you do, passing through Amash towns and horizonless acres of farmland. "Ain't that America" indeed! Thank you for this beautiful reminder of home and the lakes and farmland. Makes me smile and eager to get back! Cannot find you,J, on Facebook. Do u have a What happens at grand ma's page? I don't have a What Happens FB page - can hardly handle my blog - lol! back roads thru Michigan around Three Rivers on the way to Indianapolis where my sister lives. It was a Sunday morning and we passed an Amash church where all the men stood around on the front steps. The beauty of stark black and white imagery in the sun was breathtaking. So clean and simple. Wished I had my camera even though it would have been disrespectful to take a photo. I love that area of the state! Sounds like a lovely time. I'm originally from Minnesota (so close...) :-D. I love the comment about having no photos taken with a camera but many in your heart. Sweet... and the best kind of photos of all. Thank you for sharing this, Joan. Made me smile -- and wish I had old friends to go visit! Really a beautiful post! Yes we have some sweet memories...thanks for linking with me! Thank you, Lisa abd Connie....two of my biggest supporters and favorite bloggers! I am getting better writing about the stuff of our lives....rather than waiting for something big and cool and significant to come along! You both have shown me the importance of making connections with real/everyday life as well as allowing photos to tell a story! Joan, this is so sweet. Makes me homesick for the Midwest. I grew up in Illinois, spent summers in Wisconsin, Michigan was greatest rival in college basketball and now I live in Switzerland. I live in GA now for 20 some years, lived in New England and months at a time on SoCal....but nothing like the Midwest....you are so right; is this Margaret? Or maybe Pat? I know you both live in Switzerland! Thanks for taking time to read amd respond, my friends. Since I've moved around a bit I have old friends in many places. I love connecting with them. Me too, Carol! Those connections to our past; those that touched and enriched our lives along the way! Good for you staying in touch! Still here in the Mitten State :-) As much as I HATE winter, you can't be the summer or fall here! Absolutely, Lynne! Windows open, lakes galore, sweatshirts in early morn and late evening! I'll be back here to MI in Aug or Sept. Like your piece on the Ultimate Sacrifice....I don't want to waste time! How wonderful if we could meet somewhere in the greater D area! Love this and feel like I was on your road trip with you! There's nothing like getting in the car and having an excuse to just listen to music and sing along for a couple of hours -- the journey is even better when the destination is old friends! Thanks, Lois! I love that you could sense how I sang, the freedom I felt.....what I saw out the windows! I'm lucky to have both the anticipation of adventure amd seeing old pals!